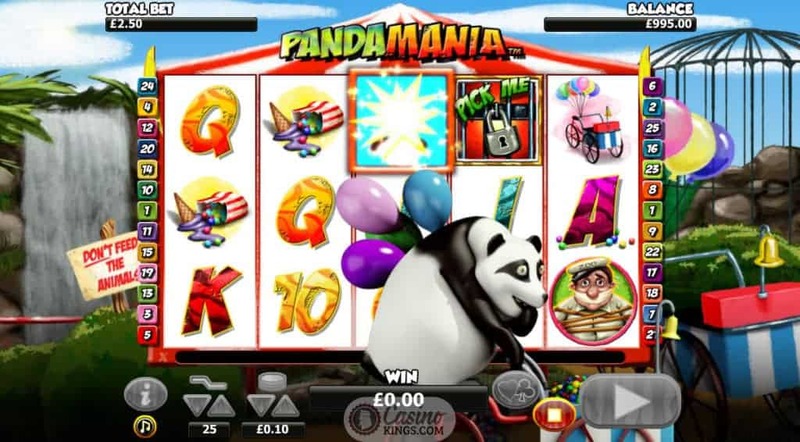 You might be thinking that the Pandamania Slot game is going to be like Wrestlemania. Only with pandas. Well, this is NextGen Gaming, so anything could be possible. 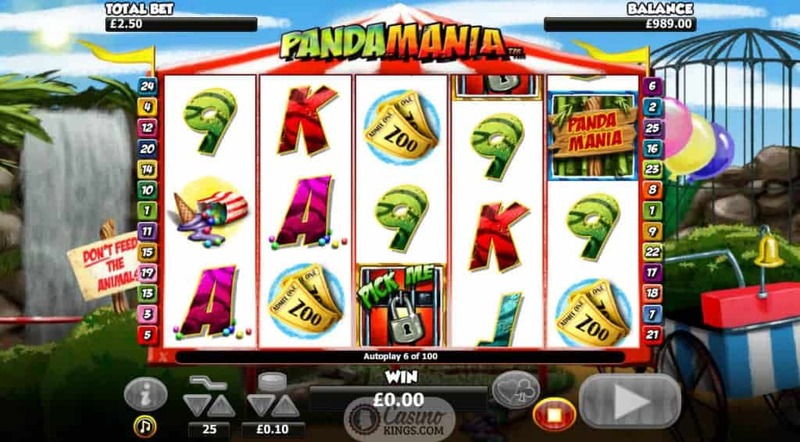 However, the mania which this five reel, 25 payline online slot describes comes from a panda that has escaped from the zoo. It’s okay, though. He’s friendly. Unless you’re the zookeeper. The good news for us is that he holds the key to winnings is that this Wild beast holds the key to our winnings, and they won’t be in bamboo shoots. This zoo lies in a perfectly picturesque setting. The sun beats down and a waterfall shimmers alluringly beyond the reel case. The five reels themselves are decorated sumptuously with paraphernalia from this panda’s escape, including a tied-up Zookeeper who happens to be our top-paying symbols. The other high symbols include a pair of zoo Tickets, a Balloon Cart and a spilled Ice Cream. So, our panda hero has a sweet tooth. Wild-looking 9s through Aces make up the game’s low symbols, giving a decent overall feel for this wild adventure. Speaking of Wilds, our Panda fulfils those duties, substituting for all symbols except Scatters and doubling all Wild wins. An Escaped Panda randomly cycles across the reels on a sweet cart, turning random symbols Wild for extra fun and games. All else we need to say is as usual for NextGen slots the betting interface is nice and simple to use with everything set out neatly and at our fingertips, while the in-game animations are as fun as ever. 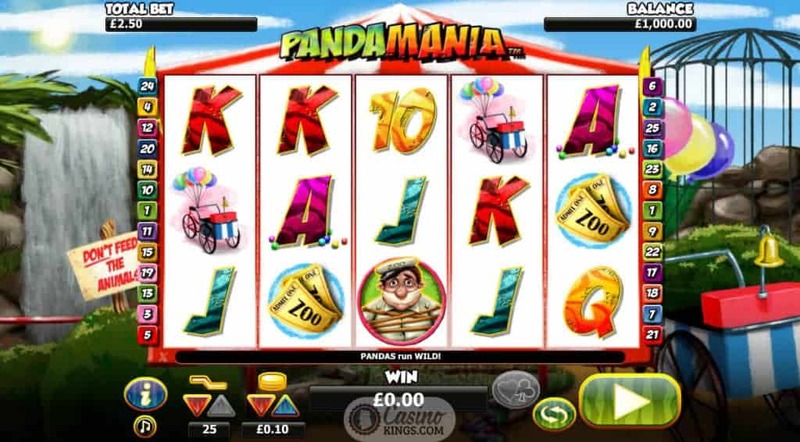 With two dedicated bonus features, Pandamania offers us plenty of bonus wins to beef up our bonus pot. Landing three Game Logo Sign Scatters triggers the Free Games feature, bringing us 10 free games with doubled prizes, which are never to be sneezed at. There are no prizes for guessing that landing three Pick Me Symbols on reels 2, 3 and 4 launches a Pick Me Bonus feature. Fortunately the feature does give out prizes, so is always welcome and can come again. 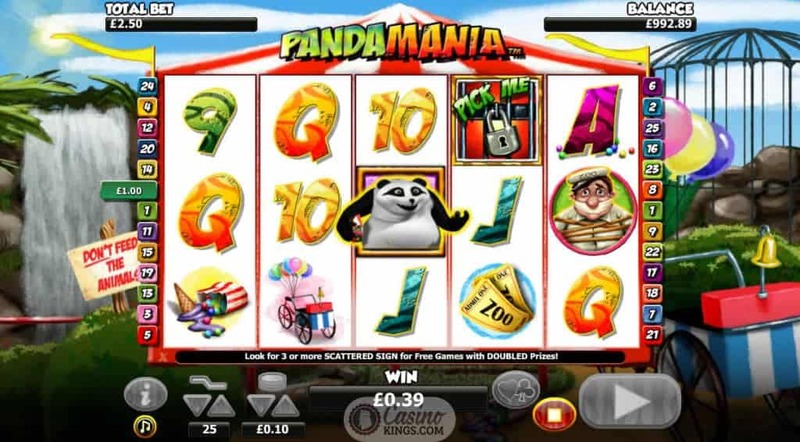 NextGen have also included its trademark Gamble feature in Pandamania, meaning we can gamble any winnings on the flip of a card. Guess the correct colour and we will double our win, guess the correct suit and we are looking at quadruple our prize.